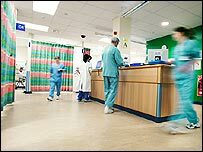 Up to 25,000 people a year may have died needlessly as hospitals waited for advice on blood clots, says an expert. The National Institute of Health and Clinical Excellence published guidance last month - two years after a critical report by MPs. Professor David Fitzmaurice, of the University of Birmingham, also claims the advice is flawed, the British Medical Journal reported. NICE said its guidance could not have been in place any quicker. Blood clots are acknowledged as one of the main threats to patients staying in hospital. It is estimated that 10% of all deaths in hospitals in the UK are attributable to pulmonary embolism, where a blood clot which forms in the lower legs travels in the bloodstream to the lungs, and causes a blockage. Some patients are at higher risk than others, and there is evidence that by assessing this risk, then using either drugs or mechanical devices such as compression stockings to improve circulation, as many as 60% of cases could be prevented. In 2005, the House of Commons' Health Committee reported that 'thromboprophylaxis' - treatment to prevent blood clots forming - was poorly implemented in the UK. It said it was concerned with the length of time that NICE, which advises on the cost-effectiveness of treatments and drugs, would take to produce its intended guidelines. The MPs asked for an independent group of experts to undertake its own separate review into the best drugs and therapies. The expert group, which included Professor Fitzmaurice, delivered its report to the Department of Health in July 2006, and NICE published its guidelines last month. However, the NICE guidance and the expert group advice were very different, despite using the same evidence to reach their conclusions. The expert group backed the use of drugs such as heparin, which thins the blood, but NICE downplayed this in favour of wider use of stockings and anti-thrombosis footwear such as inflatable boots. Professor Fitzmaurice also thinks the over-40s should be classed as 'high risk' and be more likely to receive treatment, not just the over 60s, as NICE recommends. He said: "The Health Committee's report two years ago provided an opportunity to change practice. "Meanwhile, more than 25,000 people may have died needlessly each year because of the failure to implement simple thromboprophylaxis in UK hospitals. " Dr Beverley Hunt, the medical director of the charity Lifeblood, which focuses on patients with thrombosis, said that the NICE guidance was flawed in more than one area. She said: "Lifeblood believes that if the NICE guidance is used in preference to the guidance from international guidelines and the expert group, it may result in up to 1,000 extra deaths in hospitals which could have been avoided. "The problem is that NICE committees are not required to be experts in the field they study." A spokesman for NICE said that "every effort" had been made to ensure that the two guidance reports complemented each others. He said the NICE guidance was the product of the most comprehensive 'systematic review' and analysis carried out so far on the issue. And he disputed whether there were any "substantive differences" between the two sets of advice - and said that NICE would be working closely with the expert group in the development of further guidelines on thrombosis.